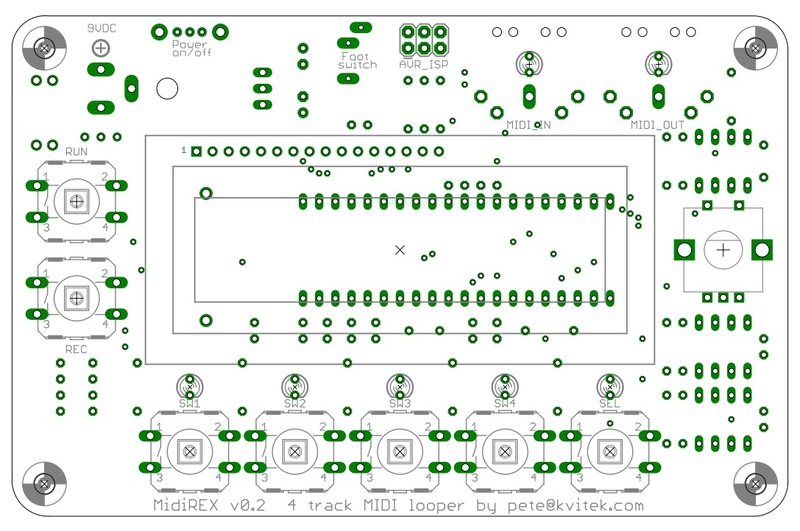 Board outline in PDF format: midirex board outline . I almost finished building your awesome MidiRex! Do i need this muboot.hex or do i just have to use the midirex.hex? Can i flash it with my USBasp Programmer and do i have take account of something? You only need to flash bootloader (muboot.hex) if you plan to update firmware via MIDI. Any AVR programmer will do. Just make sure you set the fuses correctly. Would you please tell me the 3 fuse values? Are this the correct ones? It is really a nice tool! i was looking into enclosure options, ice blue or clear hammond acrylic like this one seems cool: http://www.hammondmfg.com/pdf/1591D.pdf but of course the board is just a little too large for that… pete, could you please tell me if it is possible to cut 3,5 to 4mm on top and bottom of the board to make it fit? from the layout i would think it is uncritical. also i generally trust case mounted connectors more than pcb mount ones, so that could go. is there a need for a power switch or is it ok for the unit just to pull the psu plug? and one more: say if i chain 4 units by midi thru on the units themselves, would there be a noticeable lag between all merged notes on the output of the last unit? or is it adviceable to split the input and merge them all with external gear? Yeah, you can probably shave off a few mm from top and bottom of the board. Power switch is not critical at all, just a convenience. You install trial version of Eagle and check exact measurements of your case against minimized. MidiREX has “software MIDI THRU”, which means MIDI events are decoded then encoder before being passed thru, so delays add up. If the delays are acceptable or not depends on your application. Generally, you don’t want to have more than one THRU. i built it now with the case from ponoko. really a well designed unit, but i somehow miss an internal click. i see all the i/o pins are all fully used… it would be really cool to add a flat piezo to an output pin and glue to inside the case and have an acoustic click that way. i always liked the precise internal click on the mmt8 – i often sequence several monophonic synths, so adding another module just for the midi click (+ setting it up) is always an annoyance. maybe there is a possibility to add this instead of one midi led and merge the two midi leds to “midi activity” with a future update, would also be a great option to trigger external analog gear. Nice idea! I’ve never played with piezo buzzers and am not familiar with their electric requirements, however if they could be driven from the MCU pin, i could probably add an option to use a pin to output a beep or a click. I’ve decided to build this thing. In the BOM it’s stated that IC2 should be omitted. The Eagle files do include IC2. What should I do? Can I delete IC2 and associated components (R4 and R5) from the schematic and PCB? Thank you very much, I appreciate your quick answer! I won’t trash them then. What’s up with the much requested MIDI overdub recording feature btw? Is it possible at all? Is it likely that it would be implemented in the future? I mean recording additional MIDI data to a MIDI loop that’s currently playing. MidiREX can record data on a track while playing other tracks, then you can bounce tracks. Hi, I have just built the midirex, and from what I can tell it works with my piano keyboard! I haven’t worked out all the features yet… But here is my problem…. I am not a keyboard player, I use a guitar synthesiser with midi in and out.. But I am just getting squeaks and pops with it on the recorded track! I know the gr20 Roland sends a lot of data, like pitch bend for each string.. Actually I think it’s like six keyboards in one where each string is treated quite independently … Do you think I’ll ever get this working? Or should I focus on a audio looper…? MidiREX only on selected channel, so you must set GR20 to Poly mode when it sends all MIDI events on one channel. I’m not familiar with what GR20 sends out, however if this is standard MIDI, MidiREX should be able to cope with it. I’ve tested it with very intense MIDI streams. Ok, so I have set the synth to poly mode, as the mono mode sends each string on a seperate midi chanel… so now the synth is working similar to a keyboard, with all notes on one chanel and only one pitch bend signal. and it works as such! I tried plugging the output of the Midirex into another Keyboard sound module, and It appears to work ok… (I am not 100% sure yet as its a piano only with no pitch bend) is there any way to ignore pitch bend on the Midirex? MidiREX by itself cannot filter out PitchBend events as they are essential for voice pitch definition. You’ll need some external device to do pitch bend filtering. If you don’t have a midi filter device handy, you can build a special version of the firmware that will ignore Pitch Bend events. Hi, this looks like an amazing project! It would be my very first one though, so may I ask you a couple of questions? Is it possible to use footswitches instead of the tactile switches? I’d like to turn midirex into a pedalboard .Generally speaking, what you can do with your foot can also be done with your hands, if you just put the thing on your desk, but the opposite is not true! I’d like to have free hands, especially for selecting tracks. Therefore, I need more than two footswitches, and there’s no reason why I should buy an estrernal midi pedalboard IF i can turn this into an actual pedalboard! MidiREX track selection involves double key action when you press SHIFT key and TRK key. Doing this with one foot is problematic. MidiREX MIDI interface has direct track selection CC which could be assigned to the pedal. Hi, is there a swing / shuffle implementation? Would be great if you could quantize with swing. A global swing setting would also be interesting. No, there is no swing setting in the current version of the firmware. Are you gonna add one? You did in the midigal seq app, right? Thanks! Hi, I finished to build mine and I’d like to start the enclosure. Do you have dxf or svg files for the front panel ?